As #Fitmas2015 has now started (read about the 5 week fitness challenge I’m doing here), I thought I’d write a post about my exercise habits. Oh you lucky things, this entire week of posts has been all about healthy living. There will be more lists/opinions/life stuff coming your way soon, I promise. I got invited to try Xercise4Less recently so I went and checked out their Leeds branch. Needless to say, the gym is MASSIVE. When I arrived, I went through and it took me a few minutes to get my bearings as it’s just that big. 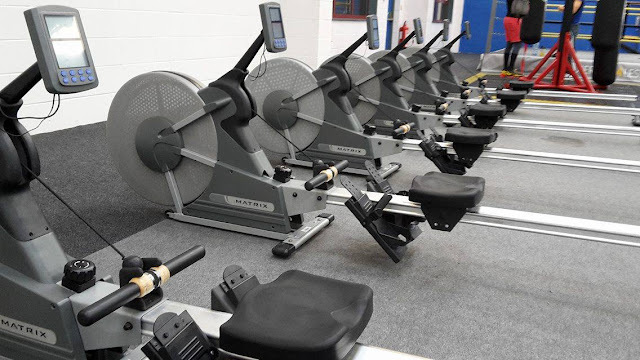 There is an enormous studio space for classes/that people can use to work out in, a room dedicated to spin classes, enough weights and cardio machines to keep most of Leeds occupied and a big free weights area. I think the building used to be a warehouse. Anyway, I’ve been told by friends who regularly go there on an evening that even during peak times, you never have to wait for anything which is impressive. Apologies for the lack of photos by the way, getting a camera out in a gym is just a bit awkward if I’m honest. Here's a sneaky shot of some rowing machines. When it comes to working out, everyone thinks what they do is the best, so I’ve always been a tad wary about posting exactly what I do online. Some people may read it and scoff, others may be intimidated. I’ve seen a quote floating about Instagram stating that you should never compare your chapter one to someone else’s chapter twenty - which really is true. You can never tell by looking at someone where they’re at in their fitness journey or what they’ve overcome to get where they are today. Personally, it took me 6 months of being a regular gym member to go to the gym and train outside of a class or a PT session. I wasn’t confident enough to believe that people weren’t going to laugh or stare, they weren’t going to be judging my abilities and that actually, I know what I’m doing. When I got to Xercise4Less, I had a workout planned but not knowing where some equipment was threw that plan out the window. 6 months ago, this would have completely freaked me out whereas now, I could just adjust what I was doing to what there was available. This routine is a workout I did recently with a friend. 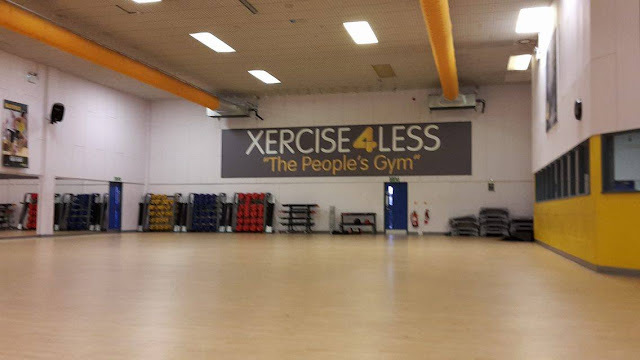 As I had an injury when I was at Xercise4Less, my workout was quite limited and cut short so I didn’t really want to post that one! Below is an example of what I’d do, which is focused more towards upper body – naturally I change the exercises every time I do this style of workout in order to avoid injury. As you can probably tell, I go for high reps at a lower weight to increase the cardio aspect rather than training for strength. How regularly I go to the gym tends to be pretty adhoc so I choose not to train isolated muscle groups – something which regular gym-goers tend to do. In the lead up to Christmas, I’m following Corinne’s #Fitmas2015 plan so I’ll be reporting back on my progress pretty regularly for you to see! Let me know what you think or if you have any advice – I’d love to hear it. I find this a really interesting post. I'm the typical 'join the gym in the summer, forget about it in winter' kind of gal and right now I've been eyeing up the amount of money that leaves my bank every month for the gym I don't go to so this is actually quite motivating for me!